Ina May Gaskin, CPM, (born March 8th, 1940) has been described as "the mother of authentic midwifery." 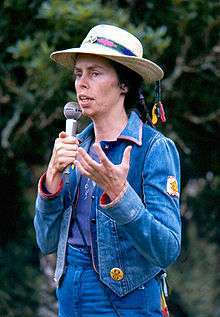 In 1971 Gaskin, with her husband Stephen, founded a commune called The Farm in Summertown Tennessee. There, she and the midwives of the Farm created The Farm Midwifery Center, one of the first out-of-hospital birthing centers in the United States. Family members and friends are commonly in attendance and are encouraged to take an active role in the birth. The Gaskin Maneuver, also called all fours, is a technique to reduce shoulder dystocia. Gaskin introduced it in the U.S. in 1976 after learning it from a Belizean woman who had, in turn, learned the maneuver in Guatemala, where it originated. In this maneuver, the mother supports herself on her hands and knees to resolve shoulder dystocia. Switching to a hands and knees position causes the shape of the pelvis to change, thereby allowing the trapped shoulder to free itself and the baby to be born. Since this maneuver requires a significant movement from the standard lithotomy position, it can be substantially more difficult to perform while under epidural anesthesia, but still possible, and can be performed by an experienced delivery room team. On June 14th, 2008, Gaskin led a workshop called 'A Guide to Natural Childbirth' at the New York Open Center in Manhattan. She served as President of Midwives' Alliance of North America from 1996 to 2002. She received the ASPO/Lamaze Irwin Chabon Award (1997), and the Tennessee Perinatal Association Recognition Award. She was featured in Salon magazine’s “Brilliant Careers” in 1999. In 2003, she was made a Visiting Fellow of Morse College, Yale University. Ina May was awarded the title "Honorary Doctor" in recognition of her work demonstrating the effectiveness and safety of midwifery by the Thames Valley University, London, England, on November 24, 2009. On September 29, 2011, Ina May Gaskin was announced as a co-winner of the 2011 Right Livelihood Award. 1 2 3 Granju, K.A. (1999) "The Midwife of Modern Midwifery" Salon.com, Brilliant Careers. ↑ Lorente, C.W. (1995). Mother of Midwifery: Ina May Gaskin Hopes to Birth a Local Movement of Midwives. Vegetarian Times, Special Women's Health Issue, July 1995. ↑ "Ina May Gaskin". Retrieved 19 September 2016. ↑ Durand, Mark A. (1992). The Safety of Home Birth: The Farm Study, American Journal of Public Health, 82:450-452. ↑ "Ina May Gaskin –". Retrieved 19 September 2016. ↑ Demott, Kathryn. (Nov. 1, 1999). Gaskin Maneuver is Gaining Popularity OB/GYN News. ↑ "Open Center - Explore. Fulfill. Transform.". Retrieved 19 September 2016. ↑ "Solar power pioneer Huang Ming wins 'alternative Nobel'". 29 September 2011. Retrieved 19 September 2016 – via www.bbc.co.uk.